The use of Aerial Drones has now become a massive innovation in Inspection allowing visual analysis of areas usually off-limits due to inaccessibility. PFL Engineering Services Ltd is introducing Remotely Operated Aerial Vehicle (ROAV) inspection techniques to provide structural inspections of high or difficult to reach structures which are faster and safer than conventional access methods. Structures include drilling derricks, elevated pipe racks, platform legs, splash zones, ducting and walkways. Our inspection technique reduces costs by removing the requirement for large areas of scaffolding and improves safety by reducing the need for working at height and over side work. 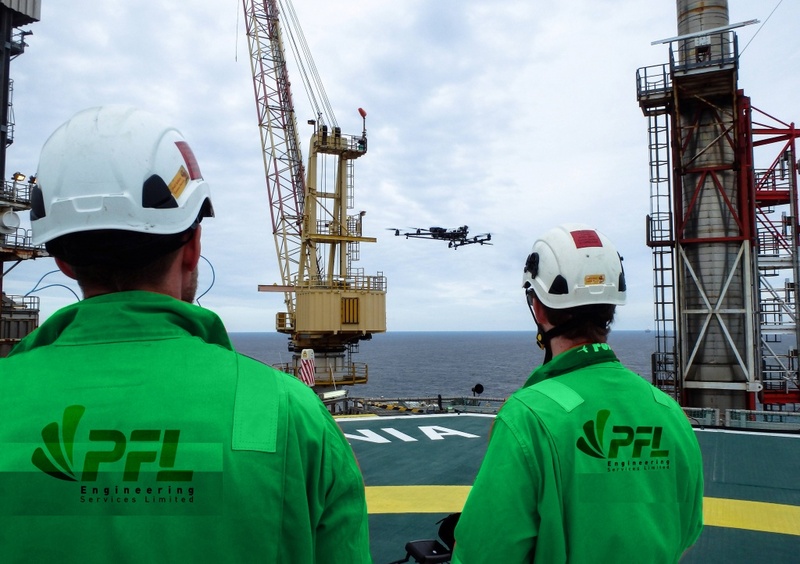 PFL Engineering Services Ltd. has the experienced and highly trained pilots required to fly under the deck of an offshore production platform or drilling rig to conduct close visual inspection of this hard to access area. Our ROAV technology can look vertically up and zoom on areas of interest. Our structural engineers then write a detailed report on the condition of the structure. This avoids the need for large scaffolding or rope access work scopes. Over side work and stand by vessels are similarly not required. Using Cyber Hawk ROAV technology and advanced photogrammetery software, PFL Engineering Services Ltd. captures a series of individual aerial images and processes them to create an accurate 3D model and highly detailed orthophoto mosaic of any offshore structure or tower in refineries or petro chemical plants. This allows the user to visually scan the full height and 360 degree platform model for any defects to be measured. Founded in 2008, Cyberhawk Innovations is the world leader in UAV inspection and survey and the conversion of UAV data into powerful management information. An industry pioneer, we have completed more than 25 world firsts since our inception. With headquarters in Scotland and offices in Houston, Abu Dhabi and Kuala Lumpur, we operate worldwide in more than 25 countries. Inspections can include the condition of the flare tips, pilot ignition systems, radiation shield, flare supporting structure, pipework, gantries and handrails. Our industry flare experts can review reports and provide recommendations on request. Saving cost by avoiding the requirement to shutdown, means typical savings are millions of dollars per inspection. Highly experience and fully qualified inspection engineers. Improved Health and Safety as detailed risk assessments and method statements are prepared before every assignment. Our expert pilots with the experience and training to actually fly under the deck of an offshore fixed or floating installation. From there, our team can zoom in on areas of interest and eradicate the need for large scaffolding, rope access work scopes, over side work and standby vessels.